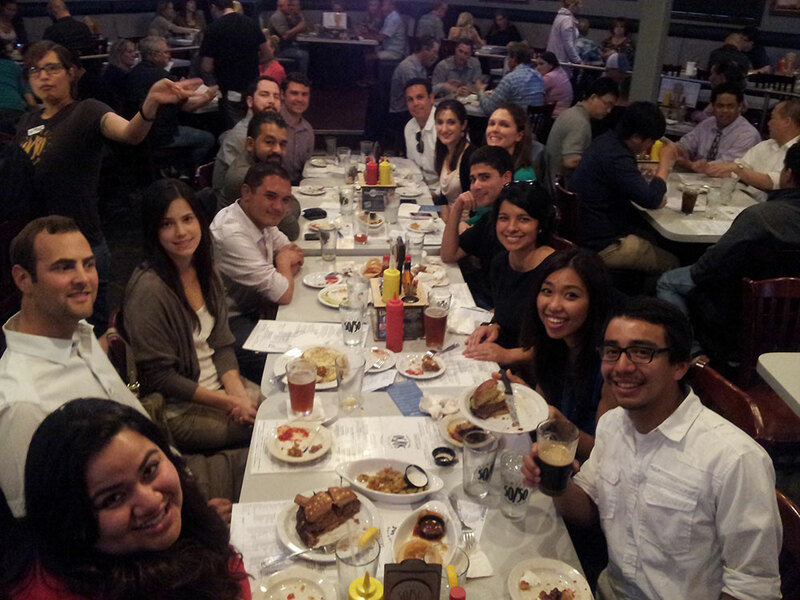 On March 12th 2013, a group of ASCE OC YMF members met up for a general meeting and happy hour at Slater’s 50/50 Burgers by Design in Huntington Beach. This meeting was all about enjoying each other’s company and good ol’ fashion indulgence. The group had its share of everything fried: pickles, mac n cheese, jalapenos, sweet potato fries and French fries topped off with bacon flavored ketchup. Slater’s 50/50 claim to fame is a burger comprised of 50% ground beef/50% ground BACON. The burgers were massive and everyone enjoyed every minute of this happy hour. After a short food coma, the meeting was topped off by a short ice breaker; everyone introduced themselves and shared fun past memories of St. Patty’s Day festivities. Thank you to all of the 15 members who attended this event, next time I hope you can all make it out!